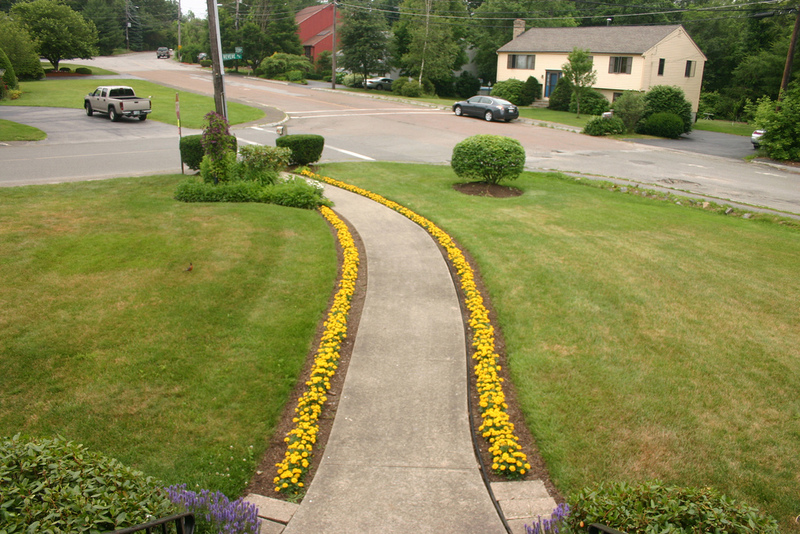 A couple of hundred years ago I started a Mother’s Day tradition at the house in Woburn… the girls (at ages 7 and 9, with help and guidance from Dad) would plant “Yellow Boy” marigolds all along the curved front walkway. We’d plant them on Mother’s Day (much to the occasional rainy-day chagrin of the girls) and Mom got to do whatever she wanted while we worked. She usually sat in the shade, sipped her coffee, and offered occasional advice to the workers and the “knows-nothing-about-gardening” supervisor. Sold in flats of 48 plants each, and spaced at 6 inches apart, it took a little over four flats (192+ individual plants) to trim the entire walkway. Last year was an aberration. 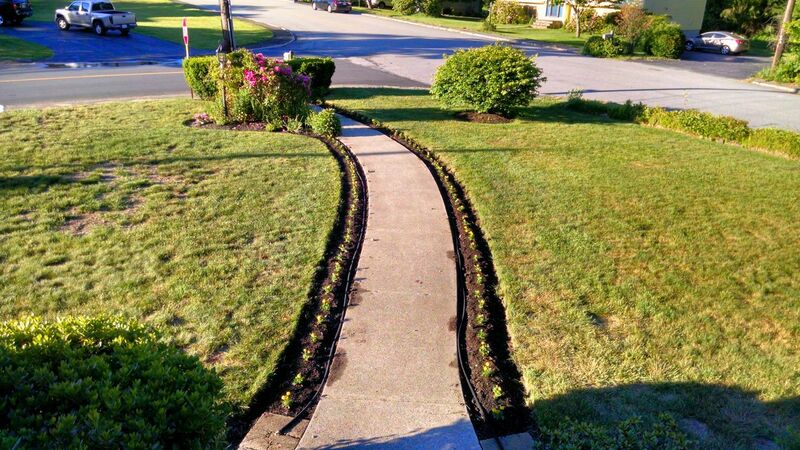 Lynn was in recovery mode from the accident, and I had a few more “ODARs” (Other Duties As Required) on my To-Do list associated with the recovery period, so we skipped the annual planning tradition and just mulched the empty flower-beds along the walkway; nothing got planted. This year we resumed the tradition. Lynn found a couple of flats of “Yellow Boy” marigolds at the local garden center last week (a bit late in the season for whole flats, that’s usually an earlier-in-the-season option) so she grabbed them. I weeded and raked and sifted the flower-beds Saturday and early Sunday to remove the weeds and the ever-present pebbles and stones, and we set up an assembly line Sunday afternoon. With Lynn’s bad ankle and my bad knee we were a lot slower than usual, but we made up for it by spacing the plants 12 inches apart instead of the usual 6, so it was half as many marigolds and half as much work (yeah, right!). At this stage of growth they look more like runway landing lights than plants (see the image at the top of this blog entry for this year’s photo right after planting), but time improves them! The photo at the right is a shot taken in 2010 to show what the marigolds WILL look like after a month or so of growth. This entry was posted in Gardening, House, Spring, Woburn, Yard Work and tagged Marigolds. Bookmark the permalink.